10:49 p.m. Closing statements: Sanders closes by saying his campaign is about creating a political revolution in which it brings tens of millions of people together to make government represent everyone and not just the powerful 1 percent. Clinton says she is not a "single-issue candidate" and "I do not believe we believe in a single-issue country." Clinton refers to the Flint water crisis, miners and people who are put down by discrimination, racism and sexism. She said she wants to stand up for those people and get rid of those barriers. "We've got to stand up for unions and working people," Clinton says, which drew applause from the Wisconsin crowd. 10:42 p.m. Question from Facebook: Name two leaders who would influence your foreign policy decisions. Sanders names President Franklin Delano Roosevelt and talks about domestic issues. He also names Winston Churchill for standing up to the Nazis during World War II. Clinton said she would choose Nelson Mandela, and then says Sanders said today that President Obama "failed the presidential leadership test." "Madam Secretary that is a low blow," said Sanders, who applauded the president and Vice President Joe Biden for making "enormous progress." "I think it's really unfair to suggest that I have not been supportive of the president." 10:31 p.m. Question: What is your strategy for dealing with Russian President Vladimir Putin? Sanders says he would supporting beefing up NATO's presence in eastern Europe. Clinton talks about Syria and says she disagrees with Sanders about allowing Iranian troops in Syria. She says it would be a non-starter to allow Iranian troops near the border with Israel. 10:29 p.m. Sanders says that former Secretary of State Henry Kissinger is not his friend. "I will not take advice from Henry Kissinger," he says. Clinton says that Sanders hasn't answered reporters' questions about who he listens to for foreign policy advice. Sanders says he doesn't listen to Kissinger. "I listen to a wide variety of voices that have expertise in various areas," Clinton says, then praises Kissinger for opening up the U.S. relationship with China. 10:17 p.m. Clinton is asked if the U.S. is ready to prevent the next terrorist attack. She says, "I think we are readier than we used to be...We have made a lot of improvements in our domestic security since 9/11." The former secretary of state says that the U.S. must go after terrorist groups abroad and at home, lead a coalition to take back territory in Iraq and Syria, go after them on social media and facilitate closer cooperation between local, state and federal governments. She talks about Donald Trump's insults toward the American Muslim community, which she says the U.S. must work with to root out possible terrorism. Sanders again says that he voted against the war in Iraq. Clinton hits back, "I do not believe a vote in 2002 is a plan to defeat ISIS in 2015. It's very important to focus on the threats today." Clinton says Sanders voted for regime change in Iraq in 1998 and regime change in Libya. 10:05 p.m. Sanders reiterates that unlike Clinton, he doesn't have a super PAC supporting his presidential campaign. Clinton argues that she has 750,000 donors and says the "vast majority are small donors." Clinton says she's prepared to take on Wall Street and points out that President Obama, when he ran for the White House, had a large super PAC with Wall Street donors and yet has taken on big banks and the financial industry by signing the Dodd-Frank Wall Street reform law. 9:57 p.m. 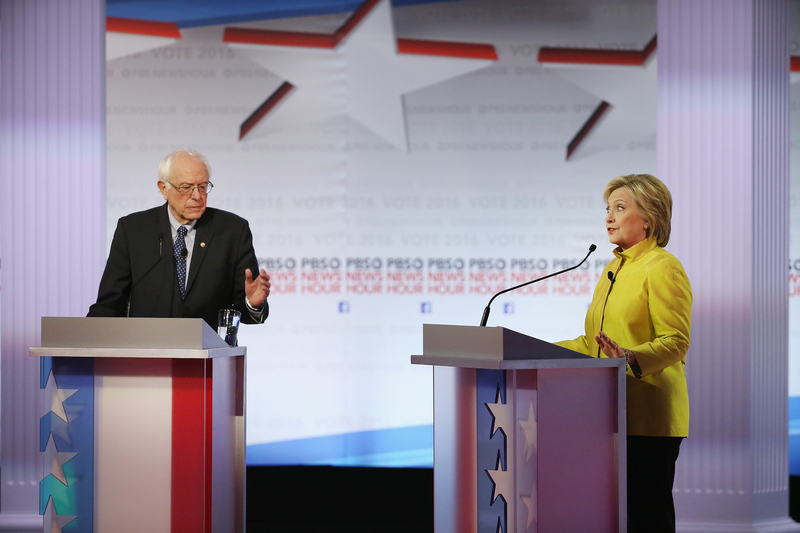 Both candidates talk about expanding Social Security. Sanders says he wants to expand benefits for senior and disabled veterans. Clinton says she wants to "help people most at risk" such as low-income people, women and even widows. But they both disagree about how they intend to expand benefits. 9:47 p.m. Sanders is asked whether he would go further than President Obama's executive actions on immigration that would permit roughly five million undocumented immigration to get work permits and avoid deportation. (The Supreme Court will review the constitutionality of those actions). He's also asked how specifically he would do it. Sanders says he would use executive orders to provide a path to citizenship if Congress doesn't pass comprehensive immigration reform. He says he opposed the administration's recent deportation raids; Clinton agrees. Clinton goes after Sanders for opposing comprehensive immigration reform in 2007. Sanders defends that vote by arguing that the Southern Poverty Law Center says the measure's guest worker programs were "akin to slavery" in which people came into this country to do guest work and were abused and exploited. Clinton points out that it was the late Sen. Ted Kennedy's bill. Sanders says Clinton opposed keeping children in the U.S. who fled Central American countries in 2014. She says they needed to be "processed appropriately" and says that families in those countries shouldn't send their kids on the dangerous journey. 9:39 p.m. Moderator Judy Woodruff says that race relations haven't improved under President Obama and asks how they would improve in a Clinton presidency when they couldn't under the first black president. "I'm not sure I agree with that assessment," Clinton says. "I think under President Obama, we've seen a lot of advances." She says Obamacare has given black Americans health insurance and now social media is exposing the "dark side of the remaining systemic racism that we have to root out in our society." The president has "set a great example," she added. Sanders says there is "institutional racism" and says if he comes president, he would create millions of jobs for "low-income kids." 9:32 p.m. A question is selected from an undeclared voter on Facebook: How would you address the disproportionately high black male prison population? Sanders says that the criminal justice system is broken and must be reform. He adds that "over-policing" in black communities needs to end. Clinton says she agrees with Sanders and begins to highlight problems in Wisconsin, where the debate is being held. She talked about Dontre Hamilton who was a young black man, unarmed, "who should still be with us." A white police officer fatally shot Hamilton in 2014. 9:29 p.m. Clinton says she's not asking people to support her for president because she's a woman, but because she's the "most qualified." 9:25 p.m. Clinton is asked why she thinks a majority of women in New Hampshire supported Sanders on Tuesday. She says she has spent her entire adult life working to make sure "women are empowered to make their own choices." She was asked whether she agrees with Madeleine Albright's recent comment about a "special place in hell" for women who don't support other women. "She's been saying that for as long as I've known her, for about 25 years," she says. 9:20 p.m. Clinton says her proposals that she would implement as president would cost $100 billion a year and would be paid for by taxing the wealthy and closing loopholes. At the same time, she vowed, "I will not throw us further into debt." She says she's conscious of the fact that she has to be "very clear" about the practicality of her proposals, "especially with young people." Sanders argues that his proposals are also paid for, but doesn't specifically lay out how it could happen. 9:18 p.m. The previous question evolves into a debate over healthcare. Sanders argues for provides healthcare to all people. Clinton defends Obamacare and says it was originally called "Hillarycare." She says she doesn't want to throw the nation into a contentious debate again over healthcare. "We are not England, we are not France," Clinton says, adding that the U.S. inherited a system that gives people healthcare through their employers. 9:11 p.m. Sanders is asked how much larger the federal government would be if he becomes president. He first dodges the question and talks about the need for a single-payer healthcare system, free college tuition at public colleges and universities and the creation of millions of jobs to improve crumbling infrastructure. "Of course there will be a limit," Sanders says when pressed to answer the question, but continued to defend his proposals. Clinton says she has seen analyses that found Sanders' proposals would expand the size of the government by about 40 percent and that the numbers "don't add up." 9:03 p.m. Both candidates are asked to deliver their opening statements. Sanders goes first and says "a lot has happened in nine months" after he initially had no political organization, no money and no name recognition. Sanders goes on to highlight the theme of his campaign: "a political revolution" that reforms a corrupt campaign finance system, targets the "rigged economy" and reforms the "broken criminal justice system." Clinton says her mission as president is to "knock down all of the barriers holding Americans back" such as black voters who face discrimination in the job market, education and housing, immigrant families who are hiding in the shadows and women who have not received equal pay. Heading into the next nominating contests, both candidates are vying for the support of minority communities. Hispanic voters are a critical bloc in Nevada and black voters will be key in South Carolina. 8:45 p.m.Hillary Clinton and Sen. Bernie Sanders, I-Vermont, are about to face off in the first presidential debate since Sanders won New Hampshire's Democratic primary on Tuesday. PBS NewsHour is hosting the debate at 9 p.m. from the University of Wisconsin in Milwaukee and CNN is simulcasting the event. The debate comes after Sanders defeated Clinton in the first-in-the-nation primary on Tuesday night by roughly 20-point margin. The next two nominating contests in the Democratic race are the Nevada caucuses on Feb. 20 and the South Carolina Democratic primary on Feb. 27 -- two states where minority voters will be critical. The last CBS News battleground tracker poll released late last month found Clinton leading in South Carolina with 60 percent support compared to Sanders who received 38 percent support.